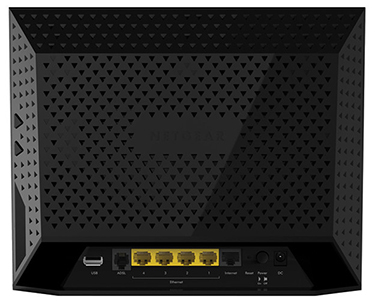 The 802.11ac wireless standard is yet to be ratified, but that hasn't stopped the big names in networking from launching forward-looking products that promise speeds up to three times faster than incumbent 802.11n. Quick out the blocks is Netgear, whose D6300 WiFi Modem Router touts next-generation WiFi speeds of up to 1,300Mbps. Priced at around £170, the D6300 is a serious piece of networking equipment and is aimed at users who are looking for a future-proof solution that touts extensive features and some of today's fastest-available wireless technologies. 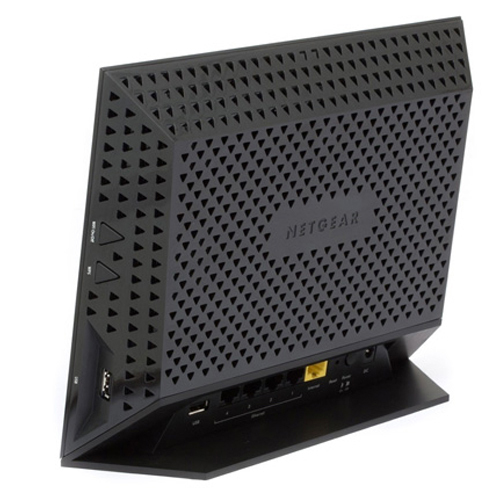 Standing 205mm x 255mm x 77mm in size and weighing 654g, Netgear's device is designed to be put on display and looks more formidable than your standard router. Sharp and slanted, the D6300 has a very modern look but the glossy-black front fascia is highly susceptible to dust and fingerprints. Our review sample has only been in situ for a week or so, and it's already due a good clean. Neatly-integrated status indicators are visible on the front of the unit, while a WiFi on/off switch and WPS instant-connect button are located on the side alongside a USB 2.0 port. 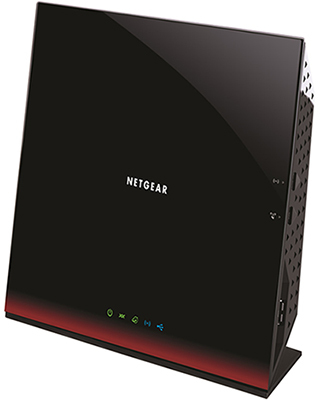 More of the action takes place around back, where Netgear has a second USB 2.0 port, an ADSL connector for the built-in ADSL2+ modem, four Gigabit Ethernet LAN ports, and a Gigabit Ethernet WAN port for connecting to a cable/fibre modem. There's also a dedicated power on/off switch, alongside the connector for the bundled external power supply. 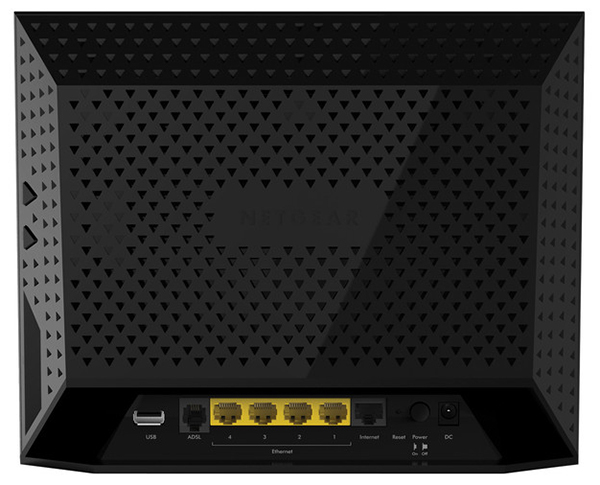 We're of the opinion that routers should favour functionality over form, but there's no harm in Netgear attempting to achieve both, and the D6300 certainly looks eye catching. As is the case with most modern routers, there's plenty more than just WiFi connectivity in the D6300's feature set. The two USB ports, for example, can be used to share content on USB hard drives across a network, with a built-in DLNA media server making it easy to store and access your multimedia on connected devices. Netgear includes cloud sharing as part of the package - so your content can be made available away from home - and having two USB ports is particularly helpful; one can be used to share data on a USB drive, while the other can be used to attach a USB printer. It's a shame a SuperSpeed USB 3.0 port isn't included at this price point, but users eyeing up the D6300 will most probably be doing so based on the router's wireless capabilities. Armed with simultaneous dual-band WiFi, the D6300 touts speeds of up to 300Mbps on the 802.11 b/g/n 2.4GHz band, along with spectacular speeds of up to 1,300Mbps on the 802.11 a/n/ac 5GHz band. The latter specification is the real talking point, though there is a catch. The vast majority of today's wireless devices lack support for the 802.11ac standard, which as we've stated is yet to be ratified and is unlikely to become mainstream for a good while yet. 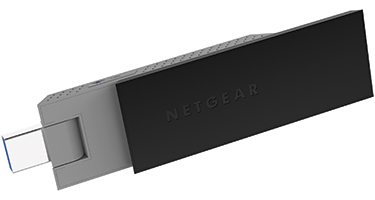 Knowing that supporting devices are few and far between, Netgear sent along an A6200 WiFi USB Adapter that supports the next-generation standard at speeds of up to 867Mbps. Impressive numbers once again, though it's unfortunate the adapter is of the USB 2.0 variety - limiting the bandwidth to a theoretical 480Mbps. There is another cost issue, too. The A6200 adapter currently retails for around £60, which, when combined with the cost of the router, makes connecting your laptop to the router via 802.11ac an expensive proposition.